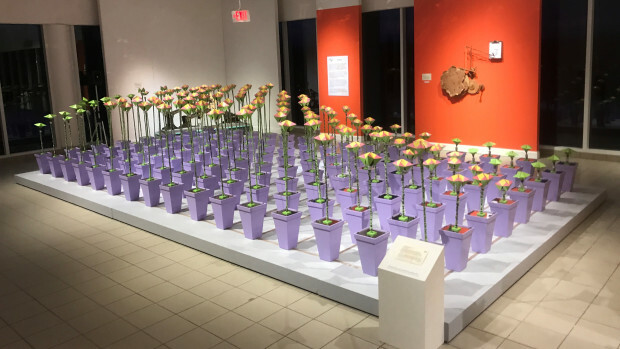 Floribots, a massive art piece created by Geoffrey Drake-Brockman in 2005, is essentially an array of 128 simple folding paper flowers that are mechanically controlled. Each large flower extends out of a rigid base, and is capable of mechanically "blooming" and extending higher. Geoffrey acquired help from Altronics, ArtsWA, JED Microprocessors, Onesteel, and family members to help construct Floribots. Asleep - A dormant state after the Floribots are deprived of stimulation for an extended period of time. All the bots go to a resting state, and is incapable of detecting movement for a short period of time. Blip - A single rapid movement while the Floribots are waiting for stimulus, but aren't asleep. Bored - A dance of sorts in which the Floribots are, in a sense, trying to attract attention. This pattern occurs when stimulation is below a certain threshold. Excited - A semi-random sequence of movement displayed after a particularly intense amount of repeated movement is detected. Naughty - A series of movements Floribots perform while Bored and unable to attract attention. Reactive - A wave-like sequence in which all the floribots bloom at a set interval in response to motion stimulus. The reaction changes based upon location, and repeated motion detection at the same location causes diminished "waves" as the hive mind grows accustomed to that particular stimulation. Wake Up - A "stretch-like" movement they flowers make when initially turned on or awoken by stimulus from the Asleep state. The Floribots can even mix different moods of varying degree, creating new and transitional behaviors. 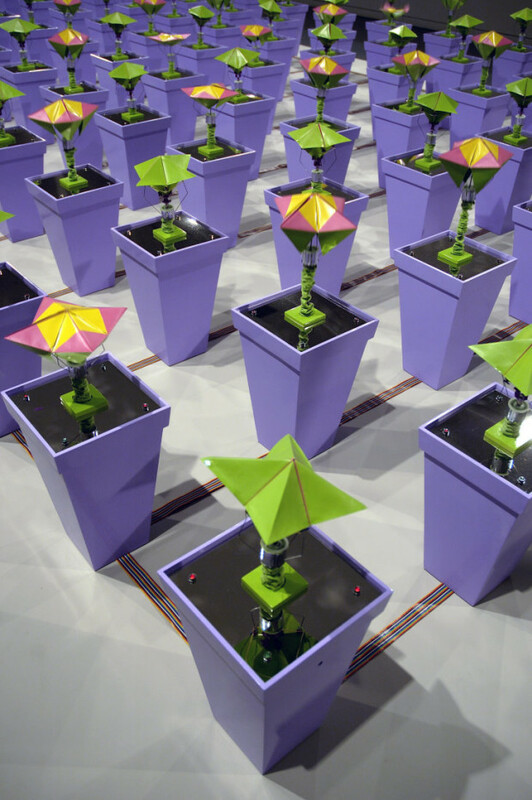 All of the artificial "organism"s reactions, moods, and movements are controlled by a microcontroller in one of the central flowerpots, which essentially manages the entirety of the hive mind. While not strictly a body augmentation, Floribots can be considered a form of Cybernetic art based upon their purpose as a reactive component to human body movement. The sensors are meant to intake input from people moving around them, and react in a somewhat predictable but "living" manner.